Originally posted at SFF Masterworks in September 2010. The Wizard Heald coupled with a poor woman once, in the king's city of Mondor, and she bore a son with one green eye and one black eye. Heald, who had two eyes black as the black marshes of Fyrbolg, came and went like a wind out of the woman's life, but the child Myk stayed in Mondor until he was fifteen. Big-shouldered and strong, he was apprenticed to a smith, and men who came to have their carts mended or horses shod were inclined to curse his slowness and his sullenness, until something would stir in him, sluggish as a marsh beast waking beneath murk. Then he would turn his head and look at them out of his black eye, and they would fall silent, shift away from him. There was a streak of wizardry in him, like the streak of fire in damp, smoldering wood. He spoke rarely to men with his brief, rough voice, but when he touched a horse, a hungry dog, or a dove in a cage on market days, the fire would surface in his black eye and his voice would run sweet as a daydreaming voice of the Slinoon River. Patricia A. McKillip's 1974 short novel, The Forgotten Beasts of Eld, opens with the quote provided above. In just two paragraphs, she has created a vivid backdrop and history around which she frames this story of love, desire, despair, and redemption. It is a fable of sorts and it certainly contains elements of this ancient storytelling mode: a vague past, rich characterizations, a temptatious moment around which the story revolves, and a stirring conclusion. Such stories revel more in the atmosphere of the setting than in character development (since the use of archetypes is common in these tales and it is the interactions of these archetypes with the fully-realized backdrop that often appeals most to readers) and The Forgotten Beasts of Eld certainly will remind its readers fondly of the best fantastical fables of the past few centuries. The story begins with one of Myk's descendents, Sybel, a sixteen year-old orphan, caring for her deceased wizard-father's fantastical beasts. She is alone on Eld Mountain, undesirous of contact with the populace below in Mondor, until one day the Sirle Coren comes bearing an infant, an infant who through her deceased mother's side is a relative of hers. This infant, which she names Tamlorn, is to be raised alone by her and away from his dread father, the aptly-named Drede. Twelve years pass. Coren returns to reclaim Tamlorn, but is rebuffed by Sybel, who worries that the youth will be used as a pawn in the Sirles' struggles against Drede. However, Drede himself soon comes to claim his child and Sybel reluctantly parts from Tamlorn, although she sends a guardian bird, a Ter, to protect Tamlorn. Sybel soon sinks into a depression and in her attempt to draw a mythical beast, the Liralen, she instead conjures forward the Blammor, a dark creature of shadow that induces fear. Drede soon sends a minion to destroy Sybel, fearing her power and angry that she had possessed his son for twelve years. This leads to an ending that is at once both literal and metaphorical at the same time. Although the above description may seem at first glance to "spoil" the story, I would argue that it doesn't even hint at the beauty found within it. McKillip draws upon various Celtic legends and their storytelling methods to hint at a dark, terrible tragedy that lies within the pursuit of hidden knowledge with darkness possessing one's soul. Sybel's dark descent into depression and a desire to wreak havoc on Drede for his attempts to destroy her are reflected in the changes in her fantastical creatures. Their anger, their hostility, and ultimately their violent acts are reflected in Sybel's mood swing. Although some perhaps might find this story to be rather "simple" on the surface, McKillip layers this text with levels of metaphorical significance that have an impact far greater than might be expected from a novel that is roughly 200 pages. In his review of McKillip's later series, Riddle-Master, Neth argues that McKillip's work shows a clear influence from J.R.R. Tolkien's Middle-Earth series. I would argue that McKillip's writing is not dependent on what Tolkien accomplished, but rather that it, like some of Tolkien's tales, draws from the wealth of folklore and legends from Irish, Scots, and perhaps Welsh tales. I am far from an expert on insular Celtic folklore, but I seem to recall there being stories revolving around different-eyed magicians, the connection between animals and mood, and the dangers of emotional responses to magical occurrences being hinted at in some Irish legends. However, I do know that the way the story is constructed feels more in tune with stories that I've heard of Irish mythical heroes than anything I remember appearing in Germanic tales. Regardless of its ultimate source material, The Forgotten Beasts of Eld is a lyrical, evocative piece. McKillip's prose invigorates the plot, making it feel fresh and important. As stated above, her adroit use of metaphors to signify not just actual plot occurrences but also to denote the meanings behind those acts adds depth to the story, making it a far more complex story than it might appear at first glance. 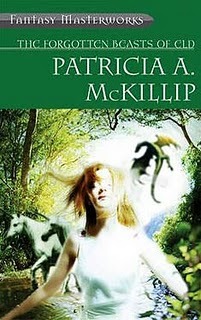 The archetypical characters fulfill their roles almost perfectly and the end result is a short "masterwork" that hints at what the maturing McKillip later accomplished in her Riddle-Master trilogy and subsequent novels.